Higher electricity tariffs have accentuated the importance of the trade-off between lowering investment cost by buying pipes with smaller diameters and the higher operating costs that result from the increased power requirement to overcome the higher friction losses of the thinner pipes. The Soil Water Irrigation Planning and Energy Management (SWIP-E) mathematical programming model was developed and applied in this paper to provide decision support regarding the optimal mainline pipe diameter, irrigation system delivery capacity and size of the irrigation system. SWIP-E unifies the interrelated linkages between mainline pipe diameter choice and the timing of irrigation events in conjunction with time-of-use electricity tariffs. The results showed that the large centre pivot resulted in higher net present values than the smaller centre pivot and the lower delivery capacities were more profitable than higher delivery capacities. More intense management is, however, necessary for delivery capacities lower than 12 mm-d-1 to minimise irrigation during peak timeslots. Variable electricity costs are highly dependent on the interaction between kilowatt requirement and irrigation hours. For the large centre pivot the interaction is dominated by changes in kilowatt whereas the effect of irrigation hours in relation to kilowatts is more important for smaller pivots. Optimised friction loss expressed as a percentage of the length of the pipeline was below 0.6%, which is much lower than the design norm of 1.5% that is endorsed by the South African Irrigation Institute. The main conclusion is that care should be taken when applying the friction loss norm when sizing irrigation mainlines because the norm will result in pipe diameters that are too small, consequently resulting in increased lifecycle operating costs. A clear need for the revision of the friction loss design norm was identified by this research. During the 1990s Eskom followed a pricing strategy whereby they wanted to supply South Africa with the lowest electricity costs in the world (Eskom, 2000). For many years electricity tariffs increased below the inflation rate resulting in a real decrease in electricity tariffs. In the early 2000s Eskom changed their pricing strategy and electricity tariffs have been increasing at rates above inflation since 2003. More alarming are the tariff hikes that have occurred since 2008 to finance new power plants to ensure that enough energy is supplied to satisfy an ever-increasing demand for energy in South Africa. The impact of higher electricity costs is compounded by the fact that the irrigation systems that were designed when electricity costs were low are not energy efficient because more emphasis was placed on lowering investment costs compared to lowering energy costs. A trade-off exists between lowering investment cost by means of buying pipes with smaller diameters and the higher operating costs resulting from an increase in the power requirement to overcome the higher friction losses of the thinner pipes. As a result many farmers may be paying excessively high electricity costs due to irrigation system designs that are not energy efficient. • The irrigation system network layout must be known. • A flat energy rate is used to calculate energy costs of an irrigation system. • The annual operating time of an irrigation system is assumed. Under a flat-rate electricity tariff structure the timing of irrigation events is unimportant because the irrigator is unable to manage electricity cost through adjustments to the timing of irrigation events which justifies an assumed annual operating time. Timing of irrigation events is of the utmost importance when considering time-of-use electricity tariffs because the irrigator is able to manage electricity costs by changing the timing of irrigation events. Evaluating the economic trade-off between pipeline investment costs and operating costs when using time-of-use electricity tariffs is, therefore, complicated and requires the integration of irrigation system design components and irrigation scheduling in conjunction with time-of-use electricity tariffs. Such a holistic approach to energy management is supported by Jumman (2009). The problem is that currently no integrated modelling framework that satisfactorily integrates irrigation system design, irrigation water management and the use of alternative electricity tariff structures exists to provide decision support to South African farmers. As a result the Water Research Commission (WRC) of South Africa solicited research with respect to 'the optimisation of electricity and water use for sustainable management of irrigation farming systems' (WRC Project K5/2279) in order to improve the profitability of farming systems under increasing energy costs (WRC, 2014). As part of the WRC project an integrated non-linear programming model that unifies the interrelated linkages between mainline pipe diameter choice and the timing of irrigation events in conjunction with electricity tariff choice was developed to facilitate better evaluation of the economic trade-offs of irrigation pipe investments for improved energy management. The main objective of this paper is to provide a description of the programming model and to demonstrate how it could be applied to provide decision support regarding pipeline investments. The following section describes the Soil Water Irrigation Planning and Energy management programming model (SWIP-E) that is used to model the trade-off between pipeline investments and energy operating costs. The SWIP-E programming model is based on the SAPWAT optimisation (SAPWAT-OPT) (Grové, 2008) model that optimises a daily soil water budget for a single crop. The SAPWAT-OPT model was further developed in this research to facilitate inter-seasonal crop water use optimisation. Detailed electricity cost calculations and a mainline pipe optimisation model (Radley, 2000) were also included in the model to facilitate electricity energy management in an integrated way. where: PIc is the total production income (R = South African Rands) for crop c; YDC is the total yield-dependent costs (R) for crop c; ADC is the total area-dependent costs (R) for crop c; IDC is the total irrigation-dependent costs (R) for crop c; INVis the after-tax investment costs (R) for an irrigation system; t is th marginal tax rate (%) and dyis the real discount rate (fraction) in year y. The first 4 terms of the objective function calculate the NPV of the margin above specified costs for a specified crop rotation. The margin above specified costs (cash flow) is calculated by subtracting the yield, area and irrigation-dependent costs from the production income. The cash flow, with an exception of electricity costs, is calculated using constant prices; thus, real prices are used. Electricity costs are increased using a real increase in electricity tariffs (increase rate above inflation). The real discoun rate is calculated using the methodology proposed in Boelhje end Eidman (1984). The NPV is calculated by subtracting the after-tax investment costs of an irrigation system from the margin above specified costs. where: Ywbc is the yield (t-ha-1) for water budget wb for crop c; pc is the crop price (R-t-1) for crop c; Ac is the area (ha) planted to crop c.
Production income is calculated by multiplying the crop yield with the crop price and area planted. The crop price is an input in the model while the crop yield and area planted are endogenously determined in the model. The impact of nonuniform water applications is modelled through the inclusion of 5 water budgets, each receiving a different amount of water. The sum of the yields obtained in each water budget is divided by the number of water budgets to calculate the average crop yield that is used to calculate production income. where: vymc is the total yield-dependent costs (R) for crop c at maximum yield potential; ym is the maximum yield potential (t-ha-1) for crop c; vyc is a scaling factor for a less than proportional reduction in yield-dependent costs (R-t-1) for crop c.
The first part of the equation represents total yield-dependent costs at maximum crop yield. The second part of the equation calculates the less than proportional reduction in yield-dependent costs for the difference between the maximum and actual yield by multiplying the difference with a scaling factor (vyc). The following example is used to explain the calculation of the scaling factor. Suppose the yield-dependent costs to produce 17 t-ha-1 and 13 t-ha-1 of maize are R13 507 and R9 123/ha, respectively. The scaling factor is then calculated by dividing the cost reduction (R4 384/ha) by the yield reduction (4 t-ha-1) to produce the scaling factor (R1 096/t) signifying the yield-dependent cost reduction per ton of reduced yield. where: Ac is the area (ha) planted to crop c; vacis the area-dependent cost (R-ha-1) for crop c.
where: ECcis the total electricity cost (R) for crop c; LCcis the total labour cost (R) for crop c; RMCcis the total repair and maintenance cost (R) for crop c, and WCc is the total water cost (R) for crop c.
where: PHi,t. is pumping hours on day i in timeslot t; kW is the kilowatt (kW) requirement; kvar is the kilovar (kVAR); tait is the active energy charge (R-kWh-1) on day i in timeslot t; trait is the reactive energy charge (R-kVARh-1) on day i in timeslot t; rcit is the reliable energy charge (R-kWh-1) on day i in timeslot t; dc is the demand energy charge (R-kWh-1) on day i in timeslot t, and fec is the fixed electricity cost (R). The electricity tariffs are divided into different charges, i.e., active, reliable and demand energy charge, which is dependent on the product of the kW requirement of an irrigation system and the pumping hours. The kW requirement is closely linked to irrigation system layout and design. Pumping hours (PH) is determined by irrigation management and the limits that are placed on irrigation hours during the irrigation cycle when using time-of-use electricity tariffs. The reactive energy charge is dependent on the kilovar (kVAR) and pumping hours of an irrigation system. The kvar is calculated from the power factor (PF) of the pump (kVAR = cos-1 PF). Each pump has a unique power factor which can be obtained from the manufacturer. The user pays for 70% of the kvarh used. The fixed electricity costs (fec) are an input parameter in the model and depend on the type of electricity tariff. where: lh is the labour hours needed per 24 h irrigation for a given size centre pivot and is the labour wage (R/h). Labour costs for permanent labourers can be considered as a fixed cost. However, labour costs obtain a variable character once labour is employed in a specific enterprise because labour costs can then be allocated between different enterprises. Labour costs for centre pivot irrigation are variable because the labour hours required are determined by the hours that the system is operational. The amount of labour that is required per operating hour is influenced by the size of the system and the type of task being performed. The model calculates the labour demand for every 24 h that the system is operated. The calculated labour demand is multiplied with the total pumping hours and the labour wage to calculate total labour costs. where: rt is the repair and maintenance tariff per 1 000 h (R-1 000 h-1) pumped for an irrigation system. where: IR is the irrigation amount (mm) for crop c on day i and wt is the water tariff (R-mm-1). Water charge is a function of the total amount of irrigation water applied over the crop area and the water tariff charged by the water user association. The water tariff includes the totality of payments that an irrigator makes for the irrigation service and is calculated on a volumetric basis. The volumetric-based charge is a fixed rate per unit water received, where the charge is proportional to the volume of water received. The charge per millimetre water was calculated by dividing the total charge by the volume of water allocated. where: PROpis the proportion (fraction) of pipe p used; rp is the cost (R-m-1) of pipe p; l is the length (m) of the main pipeline; ty_pertyis the tax deduction (%) in tax year ty; dtyis the real discount rate (fraction) in tax year ty; i_pivot is the investment cost (R) of the pivot; i_pump is the investment cost (R) of the pump and tb is the tax benefit (R) received in tax year ty for a pivot and pump investment. The main pipeline can be designed by choosing the pipe diameter such that the sum of the operating and investment costs is minimised. Calculations are done with consideration of the investment of the pipe, the tax benefit that the irrigator will receive from investing in a new pipeline and electricity costs (operating costs). Investment costs depend on the pipe costs and length of the pipe, and can be considered as a lump sum. The cost of the pipes and the length of the main pipeline are inputs in the model. The tax benefit that the irrigator will receive from investing in a new irrigation system was included in the calculation of the investment costs of the main pipeline, centre pivot and pump. The tax benefit calculations are based on a 50%, 30% and 20% tax deduction, respectively, in Year 1, 2 and 3. The present value of the tax benefit was calculated by using the same procedure as in the objective function. The following section describes the constraint set of the SWIP-E model. The section is divided into crop yield calculations, pumping hours, kilowatt requirement calculation, and resource constraints. where: kycg are the yield response factors for crop c in growth stage g, ETAwbCiJis the actual evapotranspiration in water budget wb for crop c on day i (mm) and etmci is the maximum evapotranspiration for crop c on day i (mm). where: RWCwb,c,i, . is the root water content in water budget wb for crop c on day i (mm), tamwbci is the total available moisture in water budget wb for crop c on day i (mm) and ramwb is the readily available moisture in water budget wb for crop c on day i (mm). Equation 13 shows that ETA is determined by the root water content of the soil which dynamically changes over the growth season of the crop as it is influenced by crop water demand and irrigation events. Thus, water budget calculations are necessary to determine actual evapotranspiration. The water budget routine included in the SWIP-E model originates from the SAPWAT model (Crosby and Crosby, 1999) and distinguishes between water in the root zone and below the root zone. The total available moisture in the soil that potentially can be used by the crop is a function of the water-holding capacity of the soil and the rooting depth of the crop. Only a portion of tam is readily available for crop consumption. ram is a function of root development, water-holding capacity of the soil and the P-value, which indicates the proportion of the water that is readily available for crop consumption. The P-value calculation is based on a formula proposed in Dominguez et al. (2012). If soil moisture deficits are greater than ram, the rate at which the crop consumes water is reduced from its potential level and ETA is only a fraction of etm. Irrigation systems do not apply water with perfect uniformity. Due to the lack of uniformity a part of the field is adequately irrigated while others are not. Various researchers (Hamilton et al., 1999; Grové and Oosthuizen, 2010; Lecler, 2004) modelled the impact of non-uniformity by dividing the irrigation field into different water budgets. The relationship between applied water and crop yield was explicitly incorporated in the water budget calculations by modelling 5 different water budgets simultaneously in SWIP-E. Crop yields were estimated for each of the water budgets included in the model to take cognisance of nonuniform water applications. Modelling a daily water budget within a mathematical programming framework is complex and the reader is referred to Venter (2015) for a detailed description of the necessary equations to model a two-layer daily soil water budget. where: q is the flow rate (m3-h-1) and η is the irrigation system application efficiency (%). The irrigation amount is calculated in the model, while the flow rate and irrigation system application efficiency are input parameters in the model. The irrigation amount is based on the average irrigation of the water budgets included in SWIP-E to model non-uniform water applications. The irrigation system application efficiency is used to account for spray losses (wind drift). where: thc are the available irrigation hours within each irrigation cycle on day i in time-slot t (h). The basic idea is that pumping hours in a specific time-slot cannot exceed the available irrigation hours in that specific time-slot. where: H represents the total pressure required by the system (m), nm is the motor efficiency (%) and np is the pump efficiency (%). where: hs is the static head (m) and fpis the friction loss associated with each pipe diameter for a given flow rate (m). Friction in the mainline is a function of the proportion of the pipe diameter that has been used in the mainline and the friction that was calculated through the use of the Darcy-Weisbach (Burger et al., 2003) equation for a given flow rate. The model is developed for a crop rotation system consisting of maize and wheat. Thus, the available area for each crop must be equal to or smaller than the designed centre pivot size. Important to note is that the model does not model intra-sea-sonal competing crops since the crop rotation consists of maize and wheat only. where: alloc is the water quota (m3-ha-1). Equation 20 restricts individual irrigation events to a user-specified maximum irrigation application within an irrigation cycle. The user has to specify the length of an irrigation cycle which determines the timing of an irrigation event. The constraint is used to ensure that the infiltration rate of the soil is not exceeded. where: irc. is the irrigation amount per cycle for crop c on irrigation day i (mm-cycle-1). The above resource constraints are explicitly included in the modelling process. The model was applied in the Douglas area to optimise the mainline design for 2 irrigated field sizes (30.1 ha and 47.7 ha) most commonly found in the area. The irrigation systems are designed with one centre pivot on the main pipeline with a length of 750 m. Thus, only one operating point exists. A static head of 12 m was assumed for the analyses. Four different irrigation system application capacities ranging from 8 to 14 mm-d-1 were included in the analyses to demonstrate the importance of irrigation system application capacities on the ability to exploit time-of-use electricity tariff structures to reduce irrigation costs. Centre pressure, flow rate and efficiency of the pump are necessary to calculate kilowatt requirement in the model. The centre pressure, flow rate and the efficiency of the pump depend on the size and capacity of the centre pivot and will vary between different centre pivot designs. The amount of capital required to invest in an irrigation system is a function of field size, flow rate, system pressure and the distance from the water source. Irrigation system design data for the eight scenarios were obtained from a local SABI-accredited irrigation system designer (Myburgh, 2014). 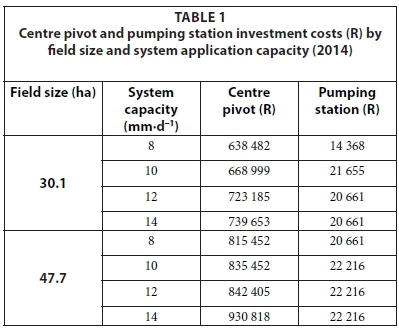 Mainline costs are dependent on the pipe diameter, which is a variable in the model, whereas centre pivot and pumping station costs are an input in the model (Table 1). The investment costs were collected from personal communications with an irrigation designer (Myburgh, 2013). An important decision for irrigation farmers in South Africa is the decision to choose between Ruraflex and Landrate (electricity tariff options). Ruraflex consists of a time-of-use option where Landrate is a flat rate. Both of the electricity tariffs consist of variable and fixed charges. The variable energy charges for Landrate include energy (c-kWh-1), reliability service (c/kWh) and network demand charge (c-kWh-1), while the fixed tariffs, which depend on the point of delivery (POD), include a service (R/POD per day) and a network access charge (R/POD per day). All of the tariffs applicable to Landrate depend on the Landrate option (Landrate 1, 2, 3, 4 or Dx) the irrigator uses. The variable energy charges for Ruraflex include active energy (c/kWh), reliability service (c-kWh-1), network demand (c/kWh) and reactive energy charge (c-kVARh-1), while the fixed tariff consists of network access (R-KVA-1-m-1), service (R-account-1-d-1) and administration charges (R-POD-1-d-1). The reliability service and network demand charge is dependent on the voltage size, while the service and administration charge is dependent on the monthly utilised capacity. The reactive energy charge is differentiated by the demand season. The active energy charge applicable to Ruraflex depends on the transmission zone (distance from the power station) and voltage size, and is differentiated by demand seasons (high and low) and time-of-use periods. 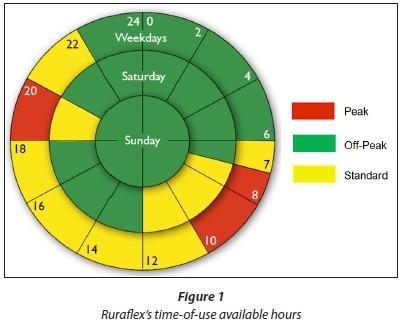 Figure 1 illustrates the time-of-use hours available in each time-slot. The available hours are different between weekdays and weekends. During the week there are 8 off-peak hours, 11 standard hours and 5 peak hours available. The weekends consist of only standard and off-peak hours (Eskom, 2014/15). A minimum wage of 12.41 R-ha"1 is used in the application of the model (DOL, 2014). The labour requirement for every 24 h that the irrigation system operates is based on the data proposed in Meiring (1989) and amounts to 0.58 labour h per 24 h. The repair and maintenance tariff calculated depends on the irrigation system design and is based on a method proposed by Meiring (1989). The tariff is a function of the initial investment of the pump and is expressed as a cost per 1 000 hours pumped. The water tariff depends on the water user association which is based on a volumetric-based charge with an allocation of 10 000 m3-ha-1. The tariff per millimetre water applied is calculated by dividing the tariff with the water allocation and is equal to 0.716 R-mm-1. where: fpis the friction loss (m) for pipe p; k is the pipe roughness (mm); d is the inside pipe diameter (mm) and Re is the Reynolds number. In addition to weather data inputs regarding the soil, root development, yield response factors and water allocation are also required. A low water-holding capacity (WHC) of 100 mm-m"1 and a soil with a depth of 1.2 m was used in the analysis. The initial depletion of both of the soils was taken as 50% depletion to calculate the RWC and BRWC on the first day of the water budget. Only a portion of TAM is readily available for crop consumption; therefore, the P-value (Dominguez et al., 2012) of maize and wheat was calculated on a daily basis. The root development of maize and wheat was collected from Van Heerden (2012). The root growth for maize and wheat was 0.3 m for the initial stage and developed from 0.3 m to 1.2 m between the crop development and mid-season stage, which is the maximum root growth for maize and wheat. As the roots of the crop develop the ground cover, crop height and the leaf area change. The growing period can be divided into 4 distinct growth stages, namely, initial, crop development, mid-season, and late season. Yield response factors are crop specific and vary over the growing season according to the growth stages. If Ky > 1 the crop response is very sensitive to water deficit with proportionally larger yield reductions when water is reduced because of stress. If Ky < 1 the crop is more tolerant to water deficits and recovers partially from stress resulting in less than proportional reductions in yield with reduced water use. If Ky = 1 the yield reduction is directly proportional to reduced water use. The yield response factors (Ky coefficients) and the length of the stages (Ky days) are based on values proposed in Doorenbos and Kassam (1979). Potential yield for maize and wheat cultivated under irrigation is assumed as 17 t-ha-1 and 8 t-ha-1, respectively. Non-uniformity of irrigation applications are modelled through the inclusion of 5 water budgets. Two water budgets received more than the average while two received less than the average amount of water. The applied irrigation for each of the five water budgets was calculated by multiplying the average applied water with a scaling factor (cu scale). The water allocation was taken as 1 000 mm-ha-1 (10 000 m3-ha-1). The assumption is made that the calculated irrigation amount will not exceed 15 mm-cycle-1 within an irrigation cycle of 2 days, due to the infiltration ratio of the soils and the application ratio of the pivot at the end. The results obtained from the economic evaluation for pipe investments are presented in this section. The section includes the results obtained for Ruraflex. 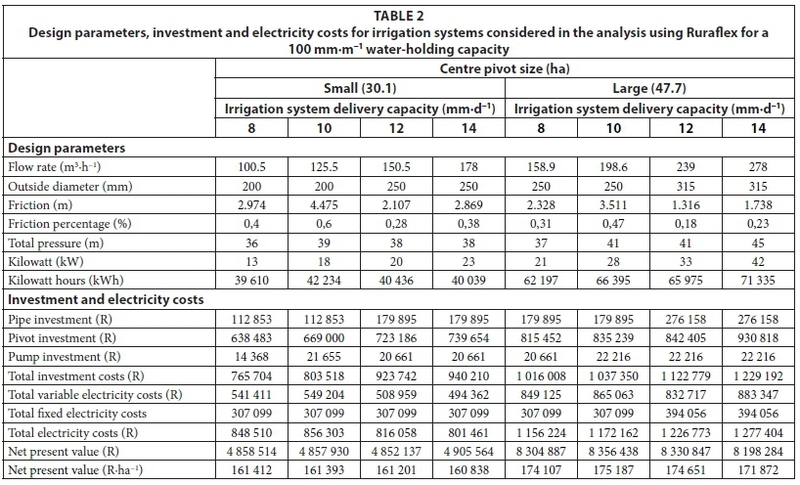 Table 2 shows the design parameters, investment and electricity costs as well as the profitability of Ruraflex for the eight different irrigation systems included in the analysis for a low water-holding capacity of 100 mm-m-1. The irrigation systems include a small (30.1 ha) and large (47.7 ha) centre pivot with irrigation system delivery capacities ranging from 8 mm-d-1 to 14 mm-d-1. If irrigation system delivery capacities increase from 8mm/d to 14 mm-d-1 the flow rates increase from 100.5 m3-h-1 to 178 m3-h-1 for the small centre pivot and from 158.9 m3-h-1 to 278 m3-h-1 for the large centre pivot. Low system delivery capacities (8 mm-d-1 and 10 mm-d-1) resulted in thinner optimal pipe diameters when compared to higher system delivery capacities (12 mm-d-1 and 14 mm-d-1). For example, the most economical pipe diameter for the low system delivery capacities for the small centre pivot is 200 mm while a 250 mm pipe diameter is optimal for the higher system delivery capacities. Larger pipe diameters are optimal for the large centre pivot compared to the small centre pivot when comparing systems with the same delivery capacities. The optimal pipe diameters increase by 50 mm and 65 mm, respectively, for low and high system delivery capacities when increasing centre pivot size. These changes in pipe diameters are a direct result of the higher flow rates associated with larger pivots. Changes in pipe diameter and flow rate (delivery capacity) have a direct impact on the kilowatt requirement to drive the water through the system and, therefore, operating costs. If the pipe diameter stays the same friction increases as the flow rates increase, resulting in an increase in the kilowatt requirement. Friction increases from 2.974 m to 4.475 m if the flow rate increases from 100.5 m3-h-1 to 125.5 m3-h-1, resulting in a 5 kW increase in the kilowatt requirement. The optimal pipe diameter increased when flow rate increased from 125.5 m3-h-1 to 150.5 m3-h-1 which resulted in a decrease in friction even though the flow rates increase. Larger pipe diameters reduce friction loss and, therefore, total pressure with lower kilowatt requirements, while increases in flow rate will cause an increase in kilowatt requirement. The direction of change in kilowatt requirement is, therefore, not self-evident if pipe diameter is increased in conjunction with an increase in flow rate. The results show that the kilowatt requirement will increase, but that this is less than proportional. For example, if the flow rate is increased from 125.5 m3-h-1 to 150.5 m3-h-1 for the small centre pivot the friction decreases from 4.475 m to 2.107 m resulting in an increase in kilowatt requirement of 2 kW. The same observation is made for the large centre pivot. The percentage friction followed the same trend as the friction loss since the length of the main pipeline is constant. Important to note is that the percentage friction loss is much less than the norm of 1.5%. The results show that friction loss as a percentage of the length of the pipe never exceeds 0.6%. The implication of using the 1.5% norm is that thinner pipe diameters would be used which decrease investment cost but at the same time increase operating cost (electricity cost). Thus, increasing electricity costs will have a significant effect on the profitability of irrigation systems if thinner pipes are used. The results show that variable electricity costs increase as flow rate increases if the optimal pipe diameter stays the same. However, variable electricity costs decrease if the optimal pipe diameter increases in conjunction with flow rate increases. For example, if the flow rate increases from 158.9 m3-h-1 to 198.6 m3-h-1, variable electricity costs increase from R849 125 to R865 063 when pipe diameter is constant and decrease from R865 063 to R832 717 if the flow rate increases to 239 m3-h-1 and the optimal pipe diameter increases Generalisations are, however, not possible since variable electricity costs decreased between the 12 mm-d-1 and 14 mm-d-1 irrigation system delivery capacities for the small centre pivot even though pipe diameter stayed the same. The reason for the decrease in variable electricity costs is that the increase in kilowatt requirement is less than the decrease in irrigation pumping hours associated with irrigating with higher system delivery capacities, which resulted in a decrease in kilowatt hours (kWh). The kilowatt hours decreased with 397kWh (40 436kWh - 40 039kWh) which caused a decrease in variable electricity costs of R14 597 (R508 959 - R494 362) between the 12 mm-d-1 and 14 mm-d-1 irrigation system delivery capacities for the small centre pivot. The interaction between kilowatt requirement and the pumping hours emphasises the importance of appropriately modelling the interaction between irrigation system design and management. Fixed electricity costs are the same (R307 099) for all the irrigation systems except for the high irrigation system delivery capacities (12 mm-d-1 and 14 mm-d-1) for the large centre pivot due to a higher kilovolt-ampere point. The fixed electricity costs for the high system delivery capacity for the large centre pivot is R394 056 due to a 75 KVA point. Total electricity costs for the large centre pivot increase as flow rate increases due to the increase in fixed electricity costs. Net present value (NPV) decreases as flow rate increases for the small centre pivot with an exception for an increase between the 12 mm-d-1 and 14 mm-d-1 delivery capacities. The increase is due to a slightly larger irrigated area (ha) which causes total NPV to increase. However, NPV per hectare decreases as flow rate increases for the small centre pivot. Increasing investment costs resulted in a decrease in NPV per hectare. The 8 mm/d delivery capacity resulted in the most profitable irrigation system delivery capacity for the small centre pivot. The NPV of the large centre pivot increases between the 8 mm-d-1 and 10 mm-d-1 irrigation system delivery capacities and decreases for delivery capacities above 10 mm-d-1. The 10 mm-d-1 delivery capacity resulted in the highest NPV for the large centre pivot. Even though electricity costs and investment costs increased between the 8 mm-d-1 and 10 mm-d-1 delivery capacity, the NPV is highest for the 10 mm-d-1 delivery capacity because the crop yield for wheat was slightly higher resulting in higher gross margins. Again the increase in total investment costs is responsible for the decreasing trend in NPVs for irrigation system delivery capacities above 10 mm-d-1 for the large centre pivot. Table 3 shows the optimised pumping hours for the alternative irrigation system designs using the Ruraflex electricity tariff. Total optimal pumping hours decrease as flow rate increases between irrigation system delivery capacities for both the centre pivot sizes. Higher flow rates can apply more water in 1 h, thus, fewer irrigation hours are necessary to apply the same amount of irrigation water. Small variations in total irrigation hours are present between the centre pivot sizes for a given irrigation system delivery capacity. Total irrigation hours for the 8 mm-d-1 delivery capacity is 2 995 h for the small centre pivot and 3 002 h for the large centre pivot. However, the distribution of irrigation hours between maize and wheat are different. The shift in irrigation hours towards maize is to reduce pumping of water during the portion of wheat's growing season that falls in the high energy demand season when the Ruraflex electricity tariff is very high. The results further show that the pumping hours in each of the time-of-use time-slots are less than the available pumping hours in a specific time-slot. The last mentioned is because the timing and magnitude of water applications are dictated by the status of the crop which is related to the soil water availability. The distribution of pumping hours within each of the time-of-use time-slots shows that maize is mostly irrigated during off-peak and standard time, while wheat needs to be irrigated during peak times when considering irrigation system delivery capacities below 12 mm-d-1. The value of the marginal product is much higher than the marginal factor cost of applying irrigation water; therefore, it is profitable to irrigate during peak time-slots. For irrigation system deliveries above 10 mm-d-1 the capacities are such that enough water could generally be applied to minimise irrigation during peak time-slots. SABI-accredited designers are allowed to design irrigation systems such that the friction as a percentage of the length of the pipeline does not exceed 1.5%. The implication of the norm is that smaller pipe diameters are installed which result in higher operating costs due to an increase in kilowatt requirement. From the results of this study the highest friction percentage for optimal pipe diameters was 0.6% and 0.47% for the small and large centre pivot, respectively. Thus, the conclusion is that the SABI design norm is much higher than the friction percentages of optimal pipe diameters and should be lowered to ensure that there is a better balance between investment and operating costs. An important factor that determines total variable electricity costs is the product of kilowatt and pumping hours. Pumping hours are reduced if the irrigation system delivery capacity is increased. The degree of reduction is almost the same between the small and large centre pivots. However, significant differences exist between the small and large centre pivots in terms of increasing kilowatt requirements associated with increasing delivery capacities. Kilowatt requirements increase with 10 kW and 21 kW, respectively, for the small and large centre pivot. The magnitude of the increase in kilowatt requirement for the large pivot causes the kilowatt hours to increase even though pumping hours are reduced with increasing delivery capacities. The relatively small change in kilowatt requirements necessary to increase delivery capacity for the small pivot causes kilowatt hours not to increase significantly with increasing delivery capacity. The direction of change in the kilowatt hours for the small centre pivot depends more on the interaction between increasing kilowatt requirement and decreasing pumping hours resulting from increasing delivery capacities. Thus, the conclusion is that the interaction between kilowatt requirement and irrigation management (hours) becomes more significant for smaller irrigated areas in determining variable electricity costs. Intense management is required for smaller irrigation system delivery capacities, because longer irrigation hours are needed in order to avoid a decrease in crop yield. The timing of irrigation is of utmost importance since it has a direct effect on electricity costs and crop yield. The assumption made by various researchers and irrigation designers that all available off-peak hours will be used first before irrigation will take place in more expensive time-of-use time-slots is voided by the fact that the water budget and the status of the crop will determine irrigation timing and amounts. The Water Research Commission (WRC) of South Africa is gratefully acknowledged for initiating, funding and managing the research project 'The optimisation of electricity and water use for sustainable management of irrigation farming systems' (WRC project K5/2279). The views of the authors do not necessarily reflect those of the WRC. ESKOM (2000) Tariff and charges booklet. URL: http://www.Eskom.co.za/CustomerCare/TariffsAndCharges/Documents/2000a.pdf [(Accessed 21 January 2016).